In July 2015 Fabio Marini, Head of Firearms Task Force at DG HOME, European Commission presented the report ‘Firearms and Violent Deaths in Europe’ by Nils Duquet and Maarten Van Alstein, researchers at the Flemish Peace Institute. The first topic is the numbers of licit and illicit firearms in Europe. Gary Mauser, Professor emeritus of the Simon Fraser University (CA) wrote: This report by the Flemish Peace Institute purports to be scientific, but it should be seen as nothing more than advocacy, because it violates the basic principles of scientific inquiry. 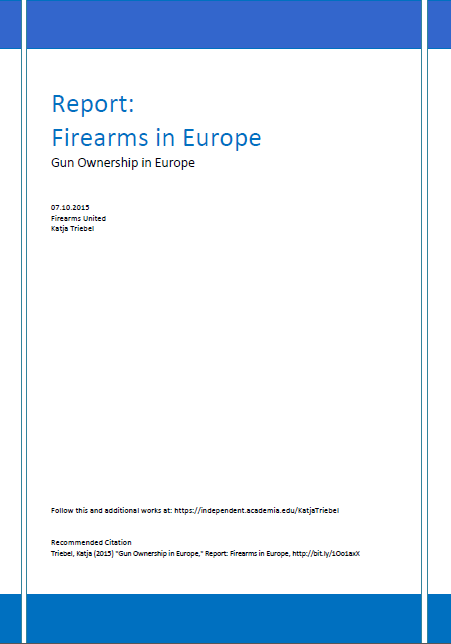 The team of Firearms United looked deeper into official data regarding gun ownership and the numbers of legal and illegal firearms in Europe and compared them with the report. We are in contact with Professor Mauser and will change our findings as soon as we receive better data.